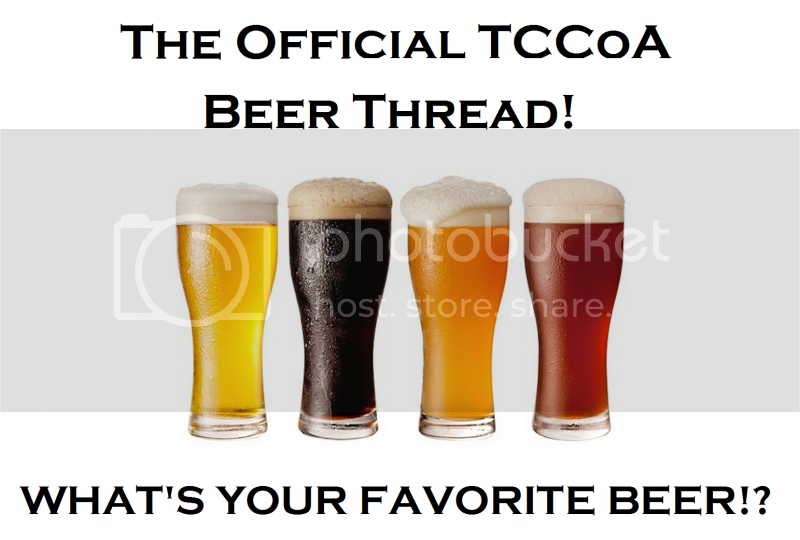 TCCoA Forums > Other Stuff > Miscellaneous > The Official TCCoA Beer Thread! WHAT'S YOUR FAVORITE BEER!? The Official TCCoA Beer Thread! WHAT'S YOUR FAVORITE BEER!? * Must be 21 or older to consume alcohol. * If you are not 21 please ask your parent or guardian if you can talk about beer on this thread. * Please drink responsibly, DO NOT DRINK AND DRIVE! Last edited by OxmanWI; 01-26-2014 at 09:43 PM. Green Bud Light Draft !!! Gotta be an ice cold CORONA! Last edited by the89bird; 03-17-2005 at 09:21 AM. I am a big beer fan. I like all kinds and this is my favorite. You guys really need to go to Montreal and get some of the Microbrews up there. McAuslan/ St Ambroise make the best beers I've tried. Their ales are as good or better than the Yuengling I usually drink, and their oatmeal stout makes Guinness seem like Budweiser. 96 Mustang GT 5spd. w/ 248A Option (GTS). Stock for now until I get the Roush on. 24k B&M Cooler, 1" lowered, Steeda UD Pulleys, Dynomax cat-back, J-mod, 3.73's, PI intake, PI cams, 03 GT MAF/Tube, SCT tuned - Gone but not forgotten. MAMN12 Drag Racing Team [email protected] In need of updated times. Any real irish man will tell you, If there is beer, we will drink it, then kick your a**. And when we get out of jail, we do it all over again. 712rwhp "hold on little buddy"
Happy St. Paddyâ€™s day! WHAT'S YOUR FAVORITE BEER!? But what I usually buy is Miller, Bud, or Michelob.... all Lite. 1998 4R70W Controlled by Baumannator TCS., 3.73 Track Lock Rear., Bauman Lev 3 Shift Kit. Today my favorite beer is Guiness or anything that comes out of the tap green! add a few whiskey shots as well. Yeungling ~ oldest brewery in the country! As far as what I can get here Its either MGD or Yeungling. 1996 Laser red 4.6 V8. Last edited by Pooperscooper; 03-17-2005 at 11:23 AM. I beleive it's Kirin (Japanese beer). I'll usually have the Kirin lager when I'm eating sushi, But If I'm out at the bar, you can usually find me with a Heineken or Amstel light in my hand. Last edited by 92blackbird; 03-17-2005 at 02:04 PM. whiskey != beer, invalid syntax. whiskey > beer, and Irish drink it too. On St. Patricks day?? Guiness!! In honor of the day, visit here! I usually just grab half a dozen bottles of watered down pee beer (Bud Light) when I'm at the bar..
Driving a Chevy, next is a Mustang. Lite beer is not beer. Its coloured water. I'll be chugging Killkenny, Smithwick's and Guiness later. Out of the damn jug. Only lightweights drink out of glasses! I'm getting right hosed later! Not Irish, it's British, but what do I care. I'm not Irish. I cant drink beer unless its in a keg so for me its...SPARKS!!! Lite beer is not beer. Its coloured water. Also Corona is not beer. It's fermented mexican urine.